Released on: Nuclear Blast. Release date: Available now. To many of the old fans of Swiss rockers Gotthard the thought of a new album with a new singer following the tragic death of original front-man Steve Lee in a terrible motoring accident two years ago - while he was on holiday in the US. - was unthinkable. Surely though, if you’re really a fan of the band’s music, then like so many other acts before, you’d think it would make sense to find a way to carry on. Doesn’t it also honour the original individual’s name and abilities? I think it does for sure. I also believe the guys have done an excellent job to with ‘Firebirth.’ The bands last album with Steve Lee was 2009’s ‘Need To Believe’ which was received with great praise and I think the band has done great to come back with an album sounding so good. 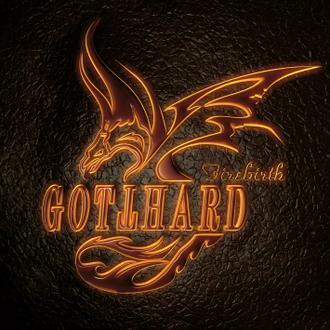 Many people have probably not heard of Gotthard, here in the States but I'll tell you, check them out, their past works which feature founding member and original vocalist Steve Lee, are very good indeed. The band released nine albums since 1992, prior to Lee's death, as well as four live albums! Something else many people may not be aware of, is that guitarist Mandy Meyer (Asia, Cobra, Krokus), also played on three studio and one of those live releases, so you see, even more reason to check these guys out some more! and Hena Habegger (Drums), as well as Freddy Scherer (Guitars) who has been with the band since 1996 alongside the bands new vocalist Nic Maeder. Opening with the first single ‘Starlight’ is a good, strong choice. The song had picked up a lot play and positive reactions from around the globe and with an almost Aerosmith type vibe to it, I think it’s an absolute winner. All power to new singer Nic Maeder for providing a very strong, yet difficult task in completely this album, you’ve done well mate! ‘Give It Real’ next rocks out a little harder initially for sure, harder and dirtier edge to it. Impressive scream in the intro too! Next it’s the very classy rock ballad ‘Remember It’s Me’ which the band had given away as an Mp3, through their site to fans. It still gives me goose bumps and there’s not many these days that do. Class guys, it’s a brilliant slice of AOR! Back to rocking things up with the edgy ‘Fight’ next, driven by some rumbling bass and gritty riffs, it’s a steady rocker. It’s funny at times I think that vocally this one comes across like David Coverdale, especially where Nic lowers the tone of his vocal in places, where otherwise the song is almost driven by an AC/DC like riff. Ballad time next with the haunting ‘Tell Me,’ which is a combination of simply played piano and backed by strings throughout. With ‘Shine’ it’s a little more up tempo, but still almost power ballad territory, but also a little pop rock like, still driven with eased power chords. Another gem though. ‘The Story Is Over’ is a song that starts with a little build up and some big riffs kick in and then it really gets into an almost classic Whitesnake like groove. Steady grooving rocker. Have to say, ‘Right On’ gives more than a nod to Bon Jovi with the voice box and then a little Coverdale like again too, nothing they haven’t done before on previous material. Another steady rocker, a little poppy perhaps but with a harder edge. You know, it all sounds very good, but there’s really only about four standout songs, this far in. Nic is not Steve Lee and he’s not bad and I personally don’t believe he has in any way changed the way the guys write. It’s a very guitar driven album, with keyboards kind of limited, but I guess with no dedicated keys player, that's the way it goes, except on the ballads, but that’s more piano and strings to be honest. ‘S.O.S.’ starts with just a guitar riff, then in comes tribal style drums and then vocals, overlaid guitar parts and bass, as the song builds and builds to get into a mid-paced rocker. Not incredibly catchy, but not bad. With ‘Take it All Back,’ it’s a fairly slow to mid paced generally easy going pop rocker in a style not unlike say Tesla. Back to a solid rock groove with ‘I Can,’ and I like the pre-chorus lead guitar parts, nice touch. This one rocks well, in an upbeat style not unlike a basic AC/DC backing riff, offering much than that as a song. Nice little, yet too short, harmony lead break. Final track, ‘Where Are You’ gives me goose bumps again and how … The multi layering is well done and these guys have ballads down so well, akin to say Europe. Nice one! Overall then, it’s a very well-crafted album, with some great highs with rockers and ballads, some may say, why so many laid back tracks? I have to say, huge kudos to the other guys in the band backing up Nic, as they effectively lost a brother in Steve Lee and to try and pick things up again after is a tough thing to do, but I think they’ve done pretty well.